The Gospel was held in contempt by those who did not believe. Paul’s ministry and message were ridiculed, and he was even physically assaulted and persecuted for the confidence that he shared concerning God’s plan for salvation. In spite of the severity of resistance and intimidation, Paul refused to be ashamed of the Gospel. He knew where he had come from for he too once had ridiculed those who preached Christ as the way of salvation. He too had violently assaulted Christians, imprisoning them and even consenting to the stoning of Stephen. However, he had no doubts concerning the reality of his conversion after the vivid encounter with Jesus on the Damascus Road. He was a new creation, and his life was now devoted to the Gospel. Paul was not ashamed of the Gospel for in it was the power of God to salvation for all men everywhere. The Gospel of grace is a message that we can boldly proclaim for it delivers man from the futility of attempting to save themselves through effort, morality, religion, and works. The completed work of the Cross delivers man from Satan’s vice grip and liberates their lives. • Through Christ, we are saved from the punishment and the penalty of sin. • We are granted eternal and abundant life, and we are set free. No wonder Paul was not ashamed of the Gospel! (2 Corinthians 5:21) Says, For He made Him who knew no sin to be sin for us, that we might become the righteousness of God in Him. In other words, Jesus took upon Himself our sin, settled the price for our redemption and grants us a position before God as a saint and as a son. • In righteousness, we can approach the throne of God with boldness or with confidence. • In righteousness, we who were outside of the covenants of God are brought near, and we become partakers of the divine nature. • In righteousness, we are not only forgiven, but we are a new creation. The old has passed away all things are new. • In righteousness, we are co-heirs together with Christ. • In righteousness, we don’t stand ashamed, naked, guilty or afraid. • In righteousness, we are clothed in garments that are without blemish. • In righteousness, we are masters over Satan and the cohort of darkness. No wonder, as the recipients of this great provision that Paul was not ashamed! There is a tendency to label anyone who is bold in sharing the Gospel as a Bible thumping preacher…kind of wild-eyed, and a bit crazy! People would like to project the image that if a person preaches the Gospel that they are “off-kilter” or perhaps a little weird. Society has become hardened against the proclamation of the Gospel. The PC world would love to silence the Gospel, and even though we have freedom of speech, they just don’t want you to use this right to discuss their salvation. • Leave me alone; I am alright as I am – every person will be okay, after all, God is a God of love. • All roads lead to God, and so I can make it on my own. • I’m not a criminal or a murderer; I do good works. • Don’t preach to me; I am ok and don’t want to be religious! This generation of sinners is our mission field; from the neighborhood to the nations we must be mobilized to carry the glorious Gospel. The feet of those who unashamedly take the message of life are beautiful. 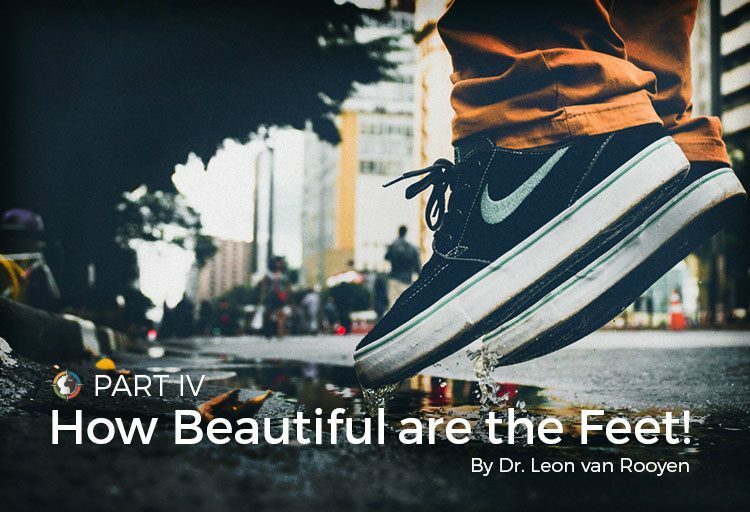 How beautiful are the feet of him who brings good news!